We have a very diverse range of gaming singles here at 316 Collectibles. We are always buying cards from Yu-Gi-Oh!, Magic: the Gathering, Cardfight! Vanguard, even Weiss Schwarz and Future Card Buddyfight. There is no gaming collection too large or too small for us and we want to buy yours. If you have any questions, feel free to contact us at buyer.316collectibles@gmail.com . 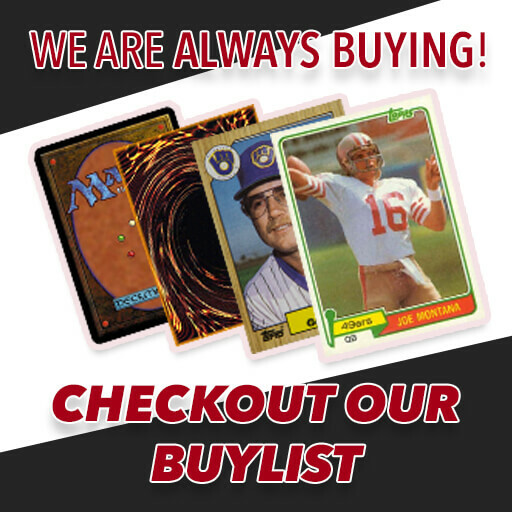 - We offer payment via PayPal, or Store Credit as well as Cash (in-store trades only). Please note that if you select payment via PayPal, additional fees may apply. - We give 50% more value in Store Credit on all non-Bulk items. Other than entry fee on events, Store Credit can be used on any item online or in-store. There is no expiration date on Store Credit. - NM / Near Mint: A card in Near Mint condition will show minimal to no wear. It may have a slight scratch, small nick, or barely noticeable border wear. In an unsleeved stack, cards in this condition will generally be indistinguishable. Foils will have little to no clouding and retain most or all of its original gloss. § Bought at buylist price. - SP / Slightly Played: A card in Slightly Played condition will show definite, minor wear. These cards may have mild border or corner wear, minor bending, slight scratching, small nicks, light scuffing or very minor border creasing. A foil card may also have moderate clouding and have lost some of its original gloss. Cards signed in ink by the artist, voice actor, game creator, or bearing a Pro Tour stamp which would otherwise be graded as Near Mint, are graded as Slightly Played. § Bought at approximately 85% of their buylist price. - HP / Heavily Played: A card in Heavily Played condition will show easily visible, but not extreme wear. It may have extensive border or corner wear, major bending, major scratching, major nicks, major scuffing, major creasing along the top border, moderate whitening, slight inking along the borders, slight tearing along the borders, minor water damage, minor dirt buildup, or slight discoloration. A foil card may also have major clouding and have lost most of its original gloss. § Bought at approximately 70% of their buylist price. - Damaged: A card in Damaged condition will show easily visible, extreme wear. It may have major whitening, heavy inking, major creasing or tearing, extensive water damage, writing on the front and/or back, missing pieces, extensive dirt buildup, or extreme discoloration. A foil card may also have lost all of its original gloss. § Bought at approximately 55% of their buylist price. We highly recommend you check your cards for condition yourself and be aware of their grade before sending them in. We try to be as accurate and fair as possible in our grading and we want you to get the full value on your trade in. We also ask that customers utilize our website for all Buy Orders. We are no longer able to accomodate non-bulk Buy Orders exceeding 20 items in-store UNLESS an online order has first been made.